Seriously :( This is what my ceiling looked like when I got home. We have been having really hard rain yesterday and today. 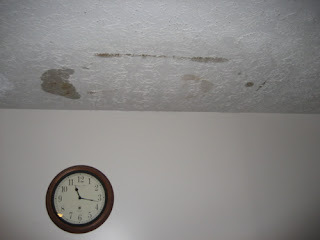 When I woke up this morning I noticed a water spot above our couch where there used to be a fireplace (the previous owners removed it). I didnt really think too much of it other than I took a picture to show Brian so that he could do something about it this weekend when he gets home. 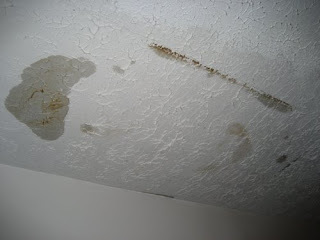 When I got home from seeing Brian and having dinner with Kyle and Joy the water damage had greatly increased. The big spot it very wet and is dripping a very little bit. The rain is still pouring hard and I am really thinking that in the middle of the night I am going to hear a great big crash and have a very large hole in my ceiling. I moved all of the furniture and put a tarp down. Hopefully that will contain it if it does fall. Im praying that this rain will stop coming. If the ceiling does fall that could equal very bad things like we would probably have to replace our roof and our flooring and have our ceiling completely redone. Hopefully our homeowners insurance will cover this. Oh and I have had to deal with 5 roaches in the past two days... Before Brian went to Sgt's course I had maybe seen 1 every month or so. Im not having a very good night.